C.A.M.P. Climb Turbo Foot - Right 2258. 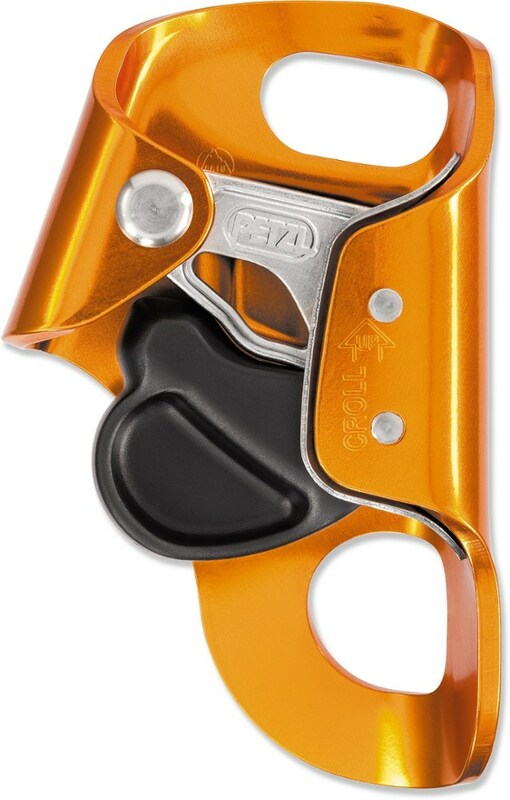 Proprietary rollers positioned where the rope tends to rub on the body of a traditional ascender ensure smoother action and a longer product life for both the ascender and the rope. The toothed cam is finished with a special anti-wear treatment and features drain holes to help prevent the build up of mud grit and ice. 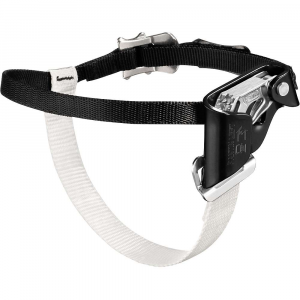 The innovative strap design provides a secure fit to any kind of boots or shoes and aligns the straps with direction of the forces being applied for optimal comfort and efficiency. The proprietary rollers also allow the Turbofoot to be rigged as a locking pulley for light hauling with a max load of 50 kg 110 lbs. (NOTE: This configuration is not intended for hauling or securing of bodies.) 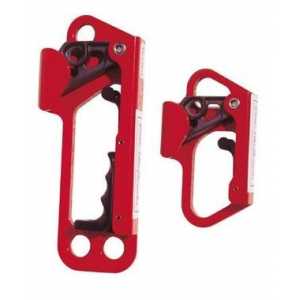 The Turbofoot is for progression only and must not be used as a safety attachment. 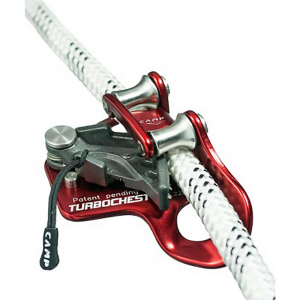 Hook Camp USA's Turbofoot Ascender to your feet and get up fixed lines easier than ever before. Like the ascender at your waist, the Turbofoot uses a toothed cam and proprietary rollers to help you stay safe in high places. Camp USA treated the toothed cam with an anti-wear treatment for your rope, and there are drain holes for mud, grit, and ice. The ergonomically designed straps fit anything from mountaineering boots to climbing shoes, and there are left and right versions available. 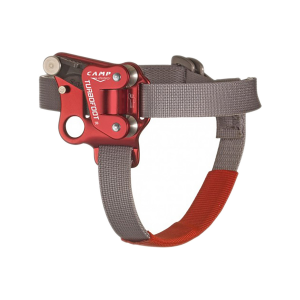 Since the Turbofoot offers a light hauling of 110 pounds, Camp USA only recommends it for progression and not as a safety attachment.